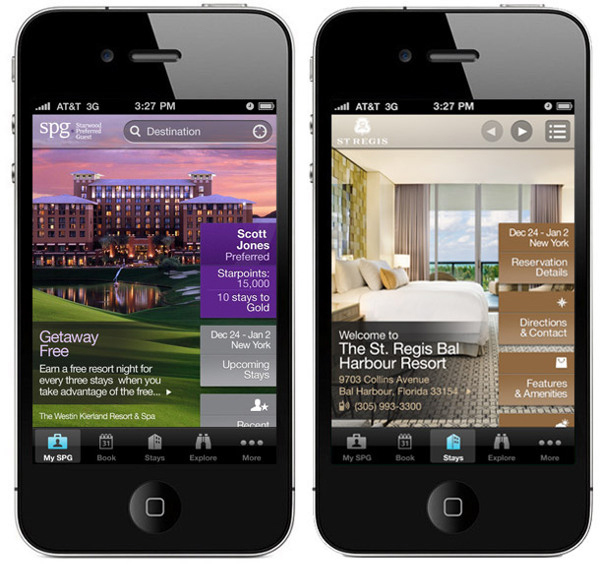 A still-growing trend in the hospitality industry, Starwood’s mobile revenue has increased by more than 300 percent year-over-year, and the company has found that the patterns of travelers using mobile devices to book rooms are markedly different from those of more traditional web bookers. 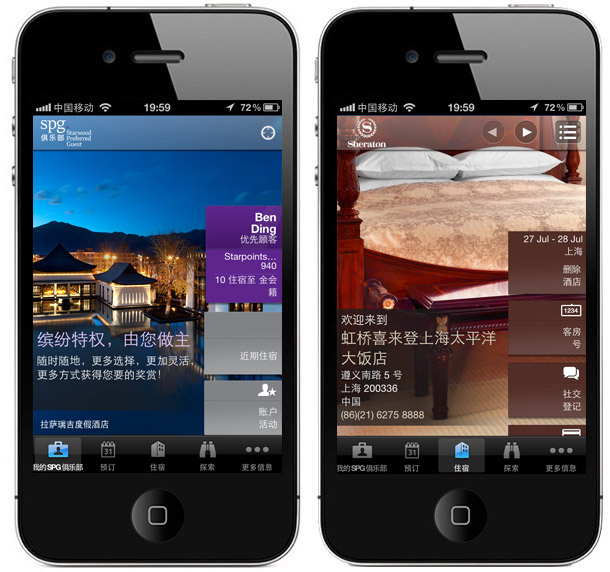 For instance, two-thirds of mobile bookings are within 24 hours of the stay, triple that of web bookings. 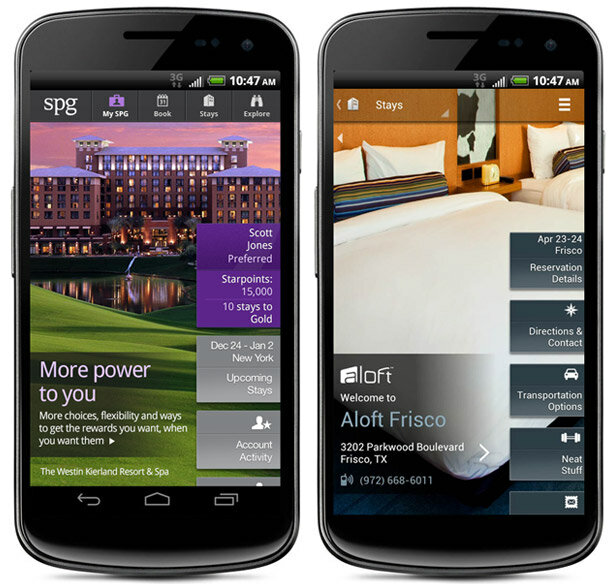 The SPG app is the first in the travel industry—and one of the first apps ever—to utilize state-aware technology, creating an interface that unites all nine of Starwood’s distinct lifestyle brands and its nearly 1,100 hotels and resorts; and adjusts the app’s look, feel and content depending on whether the user is planning, en route or already checked in to a specific hotel. 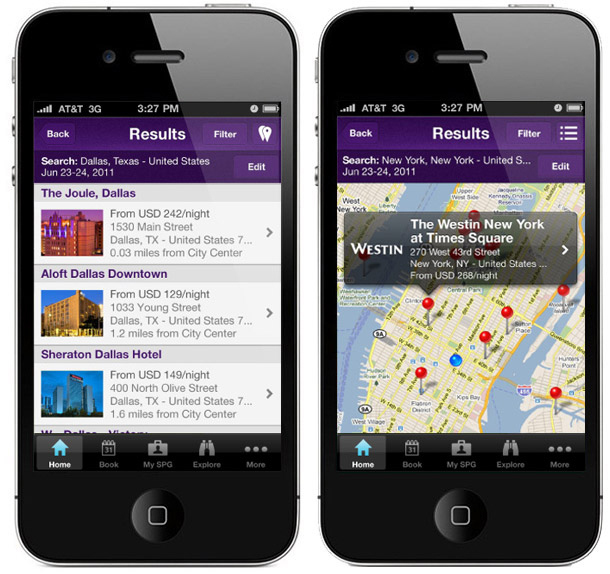 Starting 48-hours before a guest is scheduled to arrive at a Starwood hotel or resort, the app sends a push notification; and the “My Stay” interface becomes reflective of the specific brand and property, with home-screen access to key information such as hotel address in both English and the local language, weather, directions and hotel amenities. Once at the hotel, the guest’s stay is enhanced with integrated content such as their room number, on- and off-property dining and activity suggestions, and in-app access to social media channels such as FourSquare and Facebook. The app also offers an “Explore” tab for discovery when users don’t have a specific destination in mind. Explore provides customized hotel recommendations based on individual preferences such as trip type (e.g., beach, city, wedding), brand, SPG category and interests. As part of Starwood’s continued dedication to personalized guest service, the new app includes extensive content that’s easily filtered and customized. Members can use the app to store all relevant information about their SPG profile and upcoming and past stays, as well as send hotel confirmation or other details to anyone via text or email. And, it incorporates location-based services to connect users, as needed, to the closest customer care center, in addition to a live FaceTime support option. 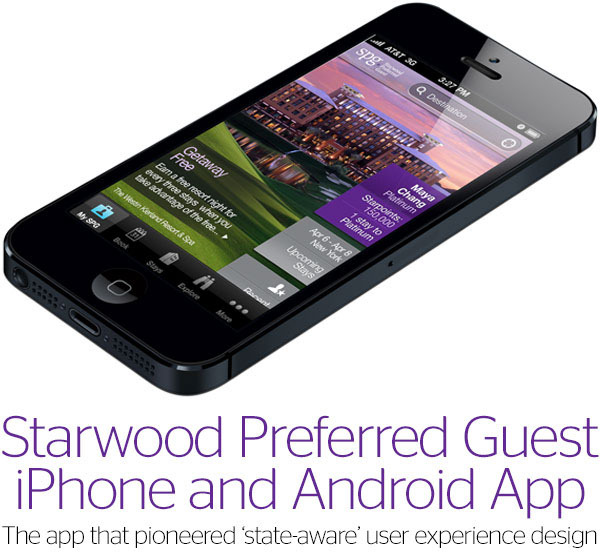 The app was created by a partnership between Starwood’s mobile team and Bottle Rocket.